Garmin’s GNX Wireless Sail Pack includes Garmin GNX Wind and GNX 20 marine instruments, gWind Wireless 2 transducer and DST800 thru-hull smart transducer. Provides you with all the equipment needed to know what’s going with the wind and in the water. At last, a sail package from Garmin, that does not require running a cable for the length of the mast back to a wind instrument network. Included in the GNX Wireless Sail Pack are a GNX Wind which interfaces via NMEA2000 and displays both true and apparent wind data, steering guidance, boat speed and more. A separate GNX 20 Glass Bonded Marine instrument display with monochrome LCD and customizable backlight colors, a gWind wireless 2 transducer for simple mast installation providing accurate wind speed as well as stable wind angle and last but not least a DST800 thru hull smart transducer providing water depth, water speed and water temperature via NMEA2000 which completes the system. All wiring to create its own system is included in the packaging, and ready to be added to any NMEA 2000 network. Both the GNX Wind and GNX Marine Instrument are constructed with a highly visible monochrome screens which can be read in a minute without study. The DST800 Smart Tri-Ducer connects directly to the GNX Marine Instrument Display to while the gWind Wireless transducer mounts to the top of the mast and pairs automatically with the GNX Wind Display when purchased together. It just doesn’t get any easier currently for the serious sailboat skipper to install and monitor the four parameters most consider to be the most important, that being, wind speed and direction, water depth, temp and speed on the water. Each Garmin GNX Wireless Sail Pack comes with:. 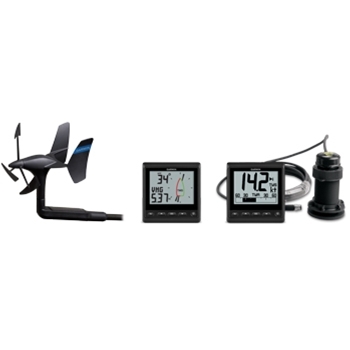 Garmin GNX Wind Instrument, GNX 20 Instrument, gWind Wireless 2 Transducer, DST 800 Smart Triducer, NMEA2000 T-Connectors, Terminators, Power Cable and Drop Cable (2M), Documentation and a Two-Year Warranty.